Livliga dinnerware is like a template for healthy eating—a simple, practical way to control portions and still feel satisfied. Founder Sheila Kemper Dietrich’s family had struggled with their weight for years. 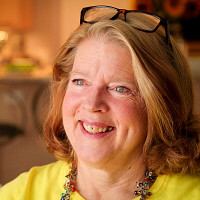 As the former executive director of Denver’s American Heart Association, she knew how important it was to stop super-sizing and start right-sizing their meals. Sheila designed portion control plates to guide them. The plates are smaller than the average dinnerware sold today (which has gotten bigger and bigger over the decades). The dinnerware patterns are actually shapes that show the right portion sizes for each food group—like grains, proteins, and veggies. And the wide rim frames the food to make it look like your plate is full. Your eye, your brain, and your stomach are satisfied you’re getting enough to eat. 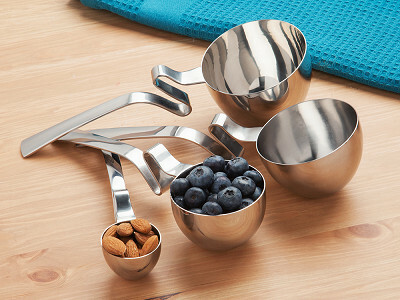 Sheila also designed stainless steel portion-control serving spoons. The long handles keep food off your hands while serving up the right amount of food for Livliga’s plates. And when you’re done dishing up, the handles have clever zigzags that rest on the serving bowl. Sheila’s first test subjects for Livliga? Herself, her husband, and their daughter. Together they lost over 100 lbs., just by eating proper portions. Hello everyone! 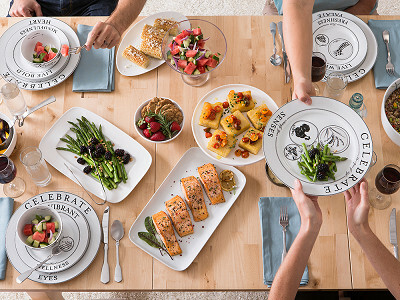 I'm proud to bring Livliga, the dinnerware that leads to mindful, healthier eating to The Grommet. I'd be happy to answer any questions you have. For the life of me, I cannot find the "protein square" on this dinnerware. Am I missing something? @Carol I promise you they are there! It is really a "squared" circle. If you look at our blue pattern-- Halsa-- it is easy to find in the photos. The darkest colored blue "icon" is the squared off circle for the protein. Vivente has the same icon as well, in its softer colors. Glad you like the idea! Live Vibrant! I LOVE your Livliga. Great idea. As of now I use a salad plate as our dinner plates, so it looks fuller - and it does help... But your dinnerware would be SO MUCH BETTER! I have lost my weight (a long arduous lifetime battle) but I have kept 250 pounds off now for 12 years. My issue now is my dear hubby has been diagnosed in his MID 50'S - as a TYPE 1 DIABETIC! Type 2 I could understand, and would BE SO MUCH EASIER TO DEAL WITH, at this stage of life - but Type 1 has its OWN UNIQUENESS. I hope your product goes well & hopefully one day I will be able to purchase some of them. But not only did my husband get his Type 1 late in life, he is also a DISABLED US NAVY VETERAN - so as much as I LOVE your products, you are out of my price range as we live paycheck to paycheck on his disability. Best of luck with your company. ???? @Pat Wow! Congratulations on your weight loss. That is a major accomplishment and to have kept it off for 12 years is something we should all be shouting from the rooftops! It is an honor for us to have you comment on our dishware and to see its benefits. You get what it takes to live a healthy lifestyle and that is what Livliga is all about! I am sorry to hear about your husband. His challenge is one that is a big one too many people have to face in this day and age...and another reason I worked hard to develop Livliga. We want to help as many people as possible reach their goals, face their challenges and live the healthier life we all want to and until now have not had the elegant tools to do so long term. Thanks for sharing your story. Let's make sure to keep in touch! I would love to stay in touch. By reading through further posts, I notice you are on Facebook. Okay if I look you up? Instead of throwing out the Disabled Veteran Pity Card request, why don't you just ask if they provide a veterans discount. I'm a 20 year disabled vet with Diabetes and still have a bit of Pride. Does your husband know you put that out there? I'd be furious! Alan, I wouldn't call it a pity request. Pat is welcome to share her story and how Livliga can be of value in her life in a manner as close to anonymity as possible, just as you have. @Alan Instead of being extremely rude, how about not being extremely rude. It "WAS NOT" a pity card - just a statement where I let someone know I liked their product and due to our situation, when WE CAN - we are interested. Oh and by the way Alan ... ???????? "THANK YOU & YOUR FAMILY 4 YOUR SERVICE TO OUR COUNTRY". ???????? We and Sheila, appreciate that support, Pat! When you can, we know you'll be happy with the game changing function Livliga brings to every meal. Thank you Mike. Your support as well as Jim's was greatly appreciated. When I told my husband about this conversation, he was MORE THAN IRATE. I mentioned my weight loss because it is something I worked hard at and am VERY proud of. I mentioned my husband's Diabetes because it is something new & this product will be beneficial "ONCE WE CAN GET THEM". And yes - I mention that my husband is a Disabled Vet ... Because in my eyes - he is my hero and to know that a "FELLOW VETERAN" has the nerve to say I have NO PRIDE was a low blow. That is why I Thank ALAN & EVERY OTHER VETERAN out there for what they gave to this country of ours. Thank you for letting me vent - and now I am done. @Pat - I apologize Pat. Your use of CAPs is misleading. There is no need to shout during your story. Tell your husband I appreciate his Service to our Country also. And congratulations on your weight loss. Mike & Sheila I apologize for all of this. Alan - my use of CAPS in my original post was not shouting. Now - during my other posts ... THAT AND THIS IS SHOUTING & SHOWING MY ANNOYANCE that a fellow Veteran would even think such a thing. I need a "SHARE" button so I can post this on my facebook page to tell those who can use these products without insulting them about their weight. @Wm M Hi there- there is a "like" button below the video for Livliga that will let people know about Livliga through your Facebook page. What I did was to post the website address as a status update: https://www.thegrommet.com/livliga#c259062 and that brought up the video so I was able to post it on my page. Thanks for any help you can give us in spreading the word! Live Vibrant! @Jerry - thanks so much for the feedback. Glad you like the video and that we got our point across about the reason and benefits of Livliga! What a creation! 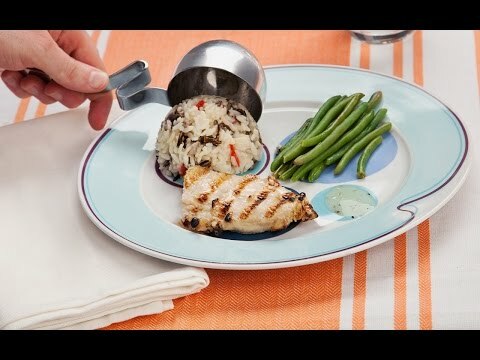 This dishware is what we need (in this day of supersized portions) to get back on track to some healthy eating. @Victoria --moderation is key! Helping our eyes understand what that looks like is why I developed Livliga. There is a lot of "psychology of eating" we incorporated into our plates. We call them "VisualQs". The cues help guide us to put the right amount of food on our plates AND also make that food look plentiful through visual illusion (like the extra wide rim on the plate). Since we do live in a super-sized world it is important to make right-sized amounts of food look plentiful so we can feel satisfied at the end of a just right meal. How high can I stack food on the plate? Is a double cut filet the size of a deck of cards and grains piled high healthy. I think most dietitians would agree that its not how much you eat but what you eat. It's a great idea, just not sure how practical it is especially if my portion control sections are paired with fried chicken, mac'n' cheese with whipped potatoes. @Kam--you bring up some great points. In reality it is not just what we eat but also how much we eat. Studies show no one knows the difference betwen a portion and a serving size. Anything we are served we think of as a serving but in reality it is a portion which can be any number of servings. 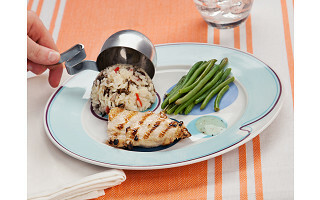 The plates and other tableware are designed to be a guide. The icons on the plates are designated serving sizes for the different food groups (there is a map on the back of each dinner plate that tells you what those sizes are for what foods according to the icons on the front of the plate as well as for the side plate, bowl and mug). These are serving sizes as suggested by the USDA. In fact, our eyes can only tell us the relative size of things. That is why I developed Livliga because I knew I had no idea what a cup of anything looked like. I needed a concrete guide to help me know what that looked liked. I also learned if you pile things too high they fall outside of the circles which lets me know I am serving myself too much! The LivSpoons were designed to make measuring even easier and each LivSpoon is a specific measurement that maps to each of the serving sizes designed on the plates or designated as fill lines in the bowls and mugs. The easier and more attractive we make right-sized eating the more likely we will be able to succeed in eating "just right" portions at every meal. @Sheila "I think most dietitians would agree that its not how much you eat but what you eat." No, actually, NO dietician agrees with that ... they both matter. Do you have a kids version? if so, is it made of something that won't be destroyed by kids dropping it? Hi Jason, there is a kid's version made of the same porcelain material as the products above. If you're interested in the kid's version, connect with our Community Experience Team here to get in touch with Sheila. Don't you feel it is a bit overpriced? $50 for a 4 place setting made in China? Profit margin must be substantial! Hi Alan, Livliga is slightly above market for a 4 place setting, but the function you get is unmatched. By controlling portions you can end up seeing savings on your grocery bills which will easily cover the extra cost over time. Hi Alan- we appreciate that pricing and value can be in the eye of the beholder. What we can share with you is that we wanted to provide a unique, high quality product for an affordable price. Two things to highlight here: Livliga dinnerware is made of high-fired porcelain. Porcelain is a sustainable material. 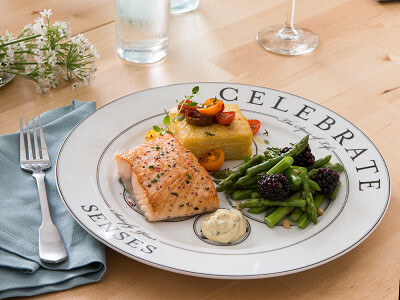 Our dinnerware is also lead free and very durable. 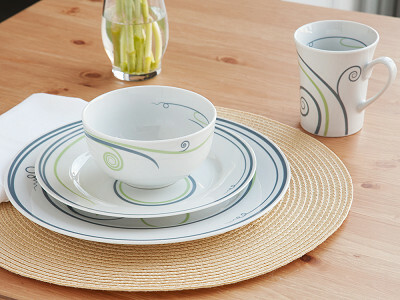 Other patterned sets of porcelain dinnerware are similarly priced. 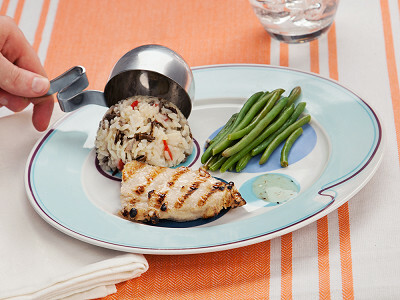 If you look at portion control dinnerware there is not anything out there that compares to our quality and design. There is one option out there made of porcelain that only offers a set of 4 plates and retails at $100! 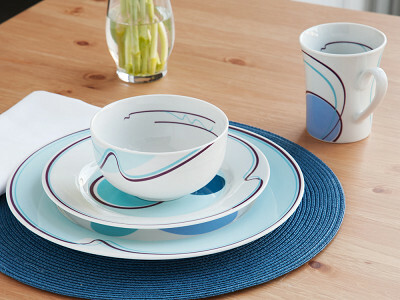 From that vantage point our 4 piece place setting is a heck of a deal! Thank you Mike and Sheila for the responses. I'm sure there is a niche market for this and I'll let those with the Koolaid in hand place their orders. As for me, I will us this on my fine china: meal measure. @Alan " Koolaid in hand"
Now if it were manufactured in the USA!!! Hi Nancy, as I said above, it is slightly more than other place settings you'll find. But by controlling portions, Livliga is setting you up for long-term savings to easily offset the increased cost. @Alan... " Now if it were manufactured in the USA!!!" You would still find something to complain about in a very rude way; you sound quite bitter. Alright everyone, we don't want this turning into a personal insult match. Livliga is a great product ready to revolutionize the way you look at a meal. If you have any questions or comments regarding the products we have available, Sheila and I are happy to be of assistance. @Joyce... Only bitter about all of the advertised products that are made for less that .10 on the dollar compared to what they sell for, when we have the will and the way to manufacture a better product here in the USA. I would happily pay $75 a place setting if it were manufactured here in the USA! But thank you for my free session of analysis. Have a great and sparkling day!!! Alan, if you hold Made in the USA products to such regard, we encourage you to check out our Made in the USA collection. One thing I noticed is that the way the plate is designed, everything has to be separate. That just isn't practical. When I cook for my family, my sister fights to avoid eating eating any sort of fruits or vegetables. The ONLY healthy meal I've found that she will eat is mix of steamed stir fry mix, pasta, and chopped baked chicken; all mixed together with a light drizzle of soy sauce. Another big problem is that not as many Americans know how to cook much without very clear directions in front of them, so if you add a small booklet of recipes, that'd probably be more practical. While the concept is great, it doesn't address all the issues of today's eating habits. Hi Lisabel - you are so right. We don't always prepare our foods as discrete dishes. The Livliga dishes are meant to be a guide. The serving amounts, even if the foods are combined should still be no more than the recommended serving sizes for each food group. As an example, I often eat salads on the dinner plate. Even though I pile all parts of the salad together, I know my meat should only be 4 ounces, and if I use croutons I know to only measure 1/2 cup of them. The salad dressing should be 2 tablespoons worth. All those measurements can be found on the back of the dinner plate as a guide and reminder. It also reminds us what a balanced meal looks like. When you have a stew or stir fry it might be easiest to serve it up in our bowls since we have subtle fill lines on the inside of the bowl for either 1 cup or 1 1/2 cup so you know what you are eating. Livliga is meant to be flexible and to provide a variety of options. We agree there is no one answer. I also wanted to mention I have a blog and offer menus and lots of recipes online since I know how challenging a process it can be to put a healthy meal together that is doable and manageable with our busy lives! You can see lots of photos of Livliga plates with all variety of meals. @Sheila Thanks, that helps more, & maybe you could add another photo to the site to show that to others as well? The pictures all show meals with very distinct separate parts to the meal. Hi Lisabel, that is to show how the plates work in controlling portions. You are certainly not limited to that layout. As Sheila said, once the proportions are in place, you can mix things up however you'd like!